The Marie Raos Ray White Howick Pakuranga Premier Men have qualified first in the Jeff Crowe Cup limited overs competition and have a bye straight through to a home semi-final in two weeks time. The home team was expecting a tough match against old rivals University, especially since University had being enjoying a run of high scores. University won the toss and batted first on a beautiful Lloyd Elsmore wicket made for batting and after 10 overs with University having posted 70 runs, it certainly looked as if the Alpacas were in for a long day. However once the first breakthrough was made when Anand was dismissed for 46 and the second wicket fell one run later when Auckland Ace Finn Allen was removed for a duck, Howick Pakuranga’s bowlers began to pile on the pressure and, apart from opener Beecroft who scored 51, University’s batsmen offered little resistance, bowled out for 161 in 34 overs. Adam Jones 4/18, Jamie Brown 3/19 and Bill Walsh 2/22 sent the opposing batsmen back to the pavilion in a procession. Howick Pakuranga’s batting line up was never going to be challenged by this total and cruised to 162/3 in 30 overs. 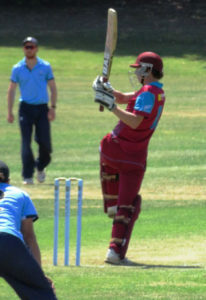 Dan Young acted as the sheet anchor with 65 off 87 balls and was part of an 81 run partnership. David Winn looked very solid finishing of 37* at the end of the match. Cameos of 23 off 24 balls from the bat of Dale Phillips and Brian Barnard’s 15* off 8 completed the score sheet. Not only did the Premier Men make their One Day semi-final but the Marie Raos Ray White Premier Reserve Men also won its match against Takapuna to make the Reserve One Day final which is being played at Lloyd Elsmore on Waitangi Day. A dominant batting performance resulted in a formidable 283/8 after 50 overs with Liam Winn scoring 68 and Josh McGregor 62. Openers Hamish Dickason (34) and Brandan Laurenzi 25 gave the side a good start with a 54-run partnership. Takapuna put up a good effort at 120/2 and looking very likely to challenge the local lads’ score. There had been a number of near misses but finally Mike Rose took a key wicket and this was followed by a devastating spell from Taine Jolley who took two wickets in one over. From then on it was an uphill struggle for the Takapuna lads who fell behind the run rate and ended up 43 runs short. Jolley had a good day taking 4/43 and Matt Blandford supported him with 2/60. The two teams meet again in the final so the local lads have a real challenge on their hands. Howick Pakuranga Premier Women completed the trifecta with two big wins in the T20 Pearl Dawson Trophy. In the first match, the ladies restricted a strong Parnell side to 88/8 in its 20 overs with Alyssa Bowden 2/18, Rae Allright 2/11 and Lucy Western 3/17 sharing the wickets. Howick cruised to victory losing only two wickets in the process. Radhika Patel top scored with 44 and Skye Bowden was 24* at the end. The second match against local rivals Papatoetoe was a much closer affair. Papatoetoe totaled 111/5 in its 20 overs. Amberley Parr 2/22 was the most effective bowler. It took Howick Pakuranga 19.1 overs to pass this total with Skye Bowden 23, Lucy Western 20, Rewa Arora 25* and Holly Topp 23* all contributing to the win. When the match finished, Howick had reached 114/5. The result of these two victories has seen the women’s side move into second place on the points table.